This is your default choice, same great shape as the G305, great MERCURY sensor and a flexible rubber cable. A lot of professional gamers prefer a neutral shape and the G203 has it all for $25. The G502 Proteus spectrum is a classic gaming mouse with a ton of buttons and features for under $50. If you don't mind a heavy mouse, this is a top choice for a budget ergonomic mouse for medium/large hands. 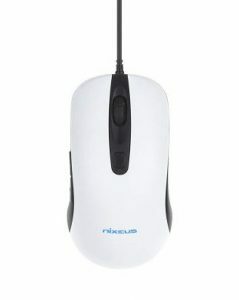 A good option if you don't like the G203 shape, Nixeus is building really nice safe mice that don't need software for a good price. A safer, no-frills ergonomic shape compared to the G502. 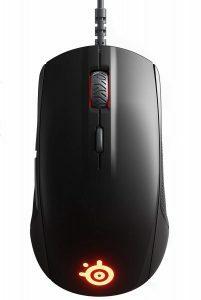 Known for having a PBT shell, this mouse has what you need for performance and not much else. Made for medium/large hands. Another small/medium ambidextrous option of you don't like the G203. The Rival 110 is a solid mouse, the build quality is slightly worse than the G203, but choosing one over the other falls solely on shape preference. You don't have to spend a bunch of to get top performance out of a gaming mouse. A lot of mice pack a lot of technology and features into their mice for a price premium. While the Logitech G Pro Wireless and Finalmouse Air58 have some great tech, they command a super high price. Luckily that costly high-end tech isn't absolutely necessary for great performance. These are the 5 best cheap gaming mice that you can get for under $50. Our favourite is the Logitech G203, super cheap at $25 but packs a great sensor and has an absolutely great shape. 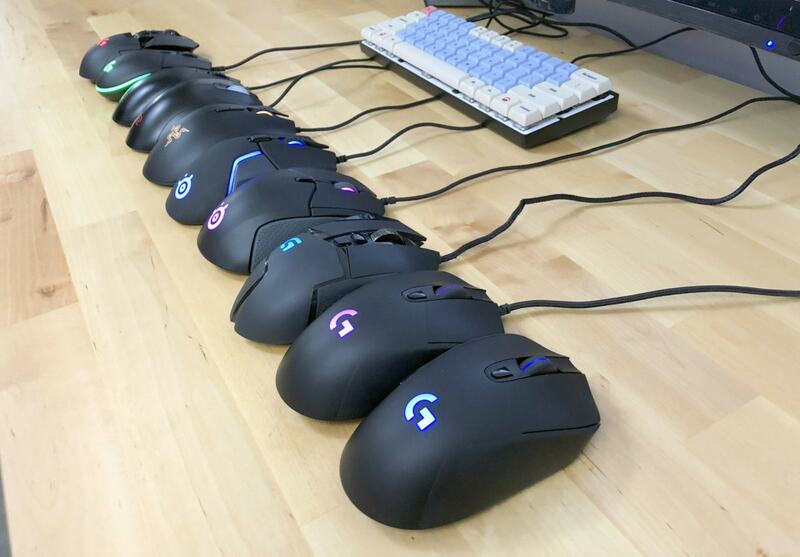 We've been playing a bunch of a games with these budget mice to get a really good feel. Outside of playing, we tested specific aspects of the mouse's sensors looking for jitter, acceleration or smoothing. We made notes on any durability concerns we had in our playtesting as well as researched on gaming communities to see if a large portion of gamers had issues with durability. Before anything, you want to like using your budget gaming mouse, just because its a cheaper mouse does not mean it needs to be uncomfortable to use. I would consider this a non-negotiable when looking for a mouse on a budget, there's no reason to sacrifice a good shape. Luckily, there are a variety of options in both ambidextrous and ergonomic shapes in the budget range to suit all types of grips and hand sizes. Just because you're frugal doesn't mean you don't want to AWP someone in the head across the map. You want a sensor that is acceleration, prediction and jitter free. Some of the budget mice we've recommended don't have the top-end sensors but all of them have a sensor that has close to raw input at acceptable DPI ranges. At this price range you might have to put up with a bit of spinning out on some mice, but for the most part, all of the recommended mice have great tracking. Shape and sensor are essentials, with these two in place, your aiming and tracking is taken care of, everything past this point is a nice to have. Luckily, most of the mice on this list are well built using pretty standard materials and thicknesses. While they're not all on the lightest mice ever list, they're at a serviceable weight with good build quality, meaning little flexing or unnecessary rattling going on. The buttons is where we start seeing the major differences between the high-end and budget mice, most of the mice on our recommendations list don't have the absolute crispiest and responsive of clicks. The Logitech G502 stands out in this category as a mouse that has really solid clicky buttons. Some mice like the Logitech G502 have stood the test of time and are backed by a great Logitech warranty. Other budget mice might have some suspect quality control and reliability, but luckily all the manufacturers back their budget mice with reasonable warranties. You'll notice most the mice on this list don't have extravagant RGB, they don't have wireless and most of them don't even have pairing software. The Rival 110 and the G502 both have software to customize macros and RGB if that's what you're interested in, but don't expect much at this price point. These kinds of features are not essential for a good performing gaming mouse anyway. The best cheap gaming mouse – Just an insane value from Logitech, sub $30 price for great performance. Decent buttons, good shape, soft cable and a solid sensor. 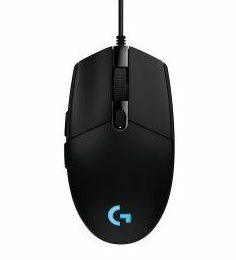 The G203 has the exact same shape as the G305 and the Logitech G Pro but costs nearly half as much. The shape is ideal for medium to small hands that fingertip or claw grip while being okay for palm grip. The shell is made of a pretty standard matte black plastic that's seen on a lot of the Logitech mice, nothing too spectacular or unusual there. The G203 actually has a better cable than the G305, its softer rubber cable drags and interferes a lot less than the Logitech G Pro cable. The G203's Mercury sensor is a great sensor, flawless with no acceleration or jittering, with a 1000 Hz polling rate and a DPI range of 200 to 8000. Where it falls behind the G305 and G Pro mice is with the buttons, they just don't feel as good as its older siblings, but they're still plenty serviceable, especially at a ~$26 price range. You even get one-zone RGB at this price range, what a value! The G203 offers such an extreme value at its price we have to put it #1 on our best cheap gaming mouse list. The best large cheap gaming mouse – The G502 is still truckin’ along with its great shape, flawless sensor and good buttons. This is a great value mouse as long as you don’t mind the weight. This mouse doesn't really need any introduction, it's the most popular gaming mouse on the planet. The newer HERO version of the G502 and its not exactly under $50. The G502 Proteus Spectrum, however, can be had for approximately $50 USD and it offers an insane value for that price. The G502 is a large ergonomic mouse with a very wide base and is one of the heavier gaming mice around. It's meant for gamers with larger lands, best suited for palm grip but works well with claw grip as well. At 121 grams, you need to know whether you prefer big tanky mice before getting the G502, if you do like these kinds of mice than the G502 is an insane value. The G502 packs a flawless sensor in the Pixart PMW3360, no jittering, no acceleration and no mouse smoothing. You're getting the high-end mouse tracking experience for half of what the high end mice cost. This mouse has some premium feeling buttons, they'd rival any top-end gaming mouse released today. The G502 has a bunch of extra buttons as well, totaling 11 buttons that you can customize with Logitech Gaming Software. The extra buttons make the G502 an especially good mouse for games with a ton of commands. Materials are also great on this mouse, the sides have a rubber grip that make picking up the mouse a little bit easier considering its heft. The coating is a matte black plastic. I've owned a G502 for what must be near a decade now, and all parts of the mouse still work perfectly. The G502 is a big hefty mouse, it's a bit more cumbersome to move around, and that is made worse by its thick and stiff cable. It's the largest detractor to getting this mouse, I'm a believe in light mice making for better aim. So as long you understand the weight your getting into, the G502 is a huge value for gamers. Solid ambidextrous shape – A super solid shape with a flawless sensor is a very good value proposition, get the Nixeus Revel if you don’t mind gambling on a bit of QA concerns from a smaller company. Anyone coming from a Steelseries Sensei will find this super safe shape familiar. This mouse will suit a small to medium hand size, better suited towards claw and fingertip over palm but it should work with any grip type. Any mouse that uses a PMW3360 at these price points is a really good thing. With this sensor you'll never have issues tracking with acceleration, jitter, or have it spin out. Coming in at just 85 grams, the Revel is a light muse that moves quickly with its soft rubber cable. The combination of its shape and weight might makes this mouse likely more comfortable for small/medium hands over the G203. There are a few detractors for the Revel, the mouse buttons are on the lighter side, not as satisfying or responsive to use as the two Logitech mice ahead of it on this list. There have been some concerns with quality assurance, but Nixeus seems to be good on backing up their mice with a warranty. 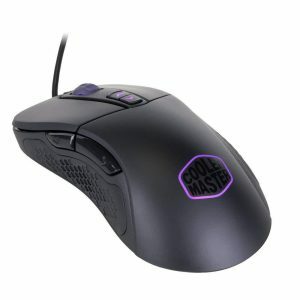 PBT quality – We love our PBT, the Cooler Master MM530 is made out of the stronger more durable plastic, combine that with a decent shape and a flawless sensor and you have a good value mouse pick. The MM530 is just kind of a play it safe for everyone kind of mouse, it suits medium sized hands best while being a little too small for palm grippers to take advantage of its shape. Outside of its shape, the MM530 does just about everything else right. It's an even cheaper alternative if you find the G502 pushing your budget. The MM530 has great snappy buttons with a really solid shell, the resulting feel is top tier. An interesting choice by Coolermaster, the PBT shell is a little more textured and durable than a traditional ABS plastic used in a lot of mice. It's safe to say shiny spots and durability of the shell will not be an issue with the MM530. The sides of the mouse are made of a textured rubber that should help with grip and lift of the mouse. Another PMW3360, you know the drill, no jitter, no acceleration, and no prediction. Really good software accompanies the MM530, Coolermaster's software lets you set colours on all 3 RGB zones of the mouse as well as set all the standard DPI, LOD and remapping keys while being pretty lightweight on your computer. If you find this shape comfortable then you're in for a treat, the MM530 is a knock out everywhere else and at its ~$30 price a hell of a value. A medium sized ambidextrous option – Good safe shape, flawless sensor and a soft rubber cord. The buttons are a little mushier than our above picks and we don’t absolutely love the shape but its still definitely a great value mouse. This mouse is an upsized option if you like ambidextrous mice but find the G203 a little small. If you think you can work with the G203's size and shape then you should get that one, it's a better mouse and it's slightly cheaper. The Rival 110 has a good shape with a light weight, soft cable, and flawless sensor. By now, you know that is a recipe for good aiming and performance. The Streelseries software serves this mouse well and allows for you to customize the mouses 2 RGB zones easily. The primary clicks on the Rival 110 are a little mushy. Again, if you like this shape more than the G203, this is your budget mouse, but if you can make the G203 work, that's generally a better buy. A fantastic ergo shape for medium to large hands. This is one of our favourite ergonomic mice and we would recommend it over the budget options if you can afford it due to its comfort and lighter weight. 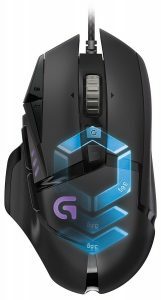 The G403 is identical in shape to the G703 and G603, only difference is it lacks wireless and the ability to charge through powerplay. Only downside of this mouse is a thick braided cable that can introduce some drag. You can find this mouse for even under $50 on sale regularly. This mouse has the exact same shape as the G203 with better buttons and fantastic lagless wireless. The cost of those improvements? Double the price at around $50 bucks. I'd argue that those improvements are worth it compared to the G203, but chose the G203 as our budget pick due to the sheer value at $25. A medium sized and comfortable ergonomic mouse by Steelseries, this mouse is just over $50 but features a flawless sensor, really nice RGB lighting and some premium materials with rubber grips and a super soft cord. The buttons and feel of this mouse fantastic. A much loved mouse shape, I'd be remiss to exclude it on a budget list, the Zowie FK series costs roughly $60. It has a good but not perfect sensor, stiffer primary buttons and a loud as heck scroll wheel, but the shape is really really nice.